I heard this song and just had to make a video to celebrate Easter. It's such a sweet song that shares the message of the true meaning of Easter. He is Risen! Happy Easter everyone! This is a fan made music video that I've wanted to do for quite awhile now. 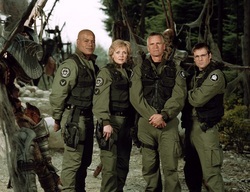 I heard this song by Buffalo Springfield and kept thinking of all the times that the SG1 team would 'Stop' and 'Look around'.